they say your life can change in an instant. let’s imagine one minute you are hiking with your family on a picturesque and somewhat treacherous trail and the next minute you are being flown by rescue helicopter to an ambulance en route to the local hospital… and scheduled for emergency hip fracture surgery. unfortunately that was the case for me exactly one year ago today. 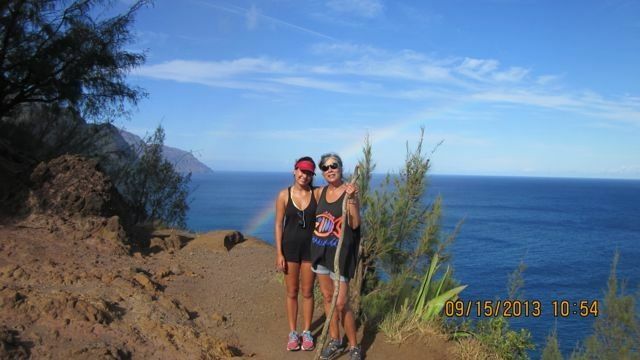 (see photo above of the lush kauai coastline and domenica and me on the first portion of the hike). fortunately we had kept the NA PALI coast hike for the last day of our summer vacation in hanalei. our days had been full of beach activities, healthy eating, mixed with relaxation and incredible sunsets. surgery was successful and the flight home not too difficult. it was so good to be back home and see domenica for two days before she left to SLO for her 2nd year at CAL POLY. recuperation seemed slow at first and i tried my best not to get discouraged. being confined to the couch ALL DAY was a huge adjustment! luckily, i had an amazing team of compassionate caregivers and professional healers. i owe my speedy recovery (back to “normal” in eight months) to my excellent surgeon on kauai, richelle takemoto, MD, the topnotch nursing staff at WILCOX hospital, my SCRIPPS physical therapist, nicole archambault, my friend and acupuncturist alan toyofuku, my friends and neighbors who kindly brought us nourishing lunches and dinners, and my siblings who checked in frequently with encouragement and love. not to mention, my dear neighbor julie thomas who visited nightly to make me comfortable, massage my swollen leg/foot, replenish my water jug and share stories and laughs. “in sickness and in health” and blessed to have him by my side. i was thinking about dave and the rest of my caregivers recently when domenica and i hiked MADONNA mountain, a dormant volcano in SLO. i was contemplating how fortunate i was to be back on the trail (albeit an easy hike compared to the NA PALI coast trail) with my daughter, taking in the beautiful surrounding hills, and breathing the invigorating fresh morning air. all in all, the year flew by and perhaps i am a more appreciative person (of my body, of my family and friends, and of the earth) due to this “minor setback” as i’d like to call it. however, for future hikes, trekking poles are the way to go! This entry was posted in news from color my kitchen! 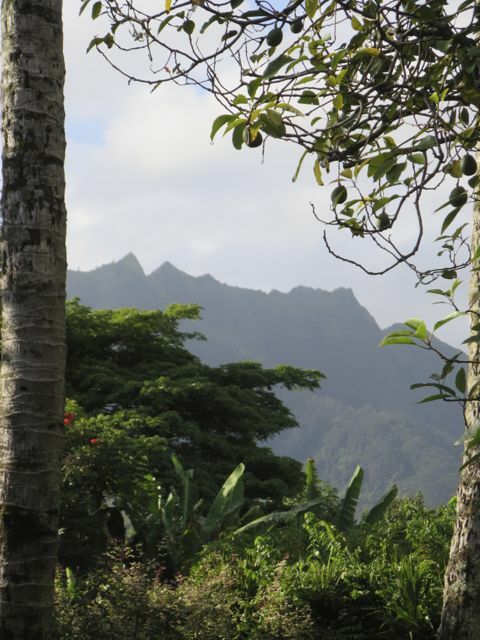 and tagged family, hiking, hip surgery, kauai, NA PALI, recovery by Elena. Bookmark the permalink.